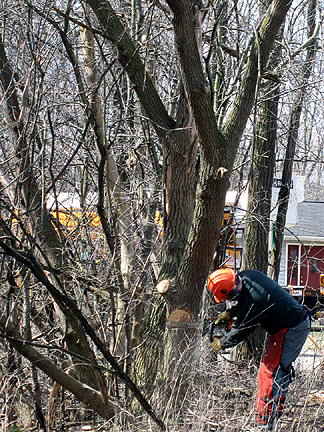 City foresters came on Wednesday to cut down three ramshackle, dying boxelder trees (Acer negundo) on city park property near the south side of my house. In order to be able to get at the trees, they had to remove a bit of over- and undergrowth in the area. And that growth, my friends, was none other than my sworn garden enemy, buckthorn. Yippee!! Now, you know how much I hate buckthorn. I know you do. You read about my removal efforts here. You cheered about my clearing progress here. 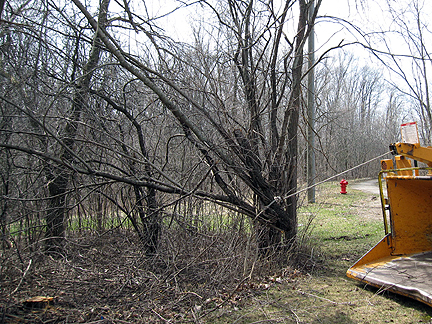 You patiently listened to my Scorn of Buckthorn song here. So I don't have to tell you how gratifying it was to see some of it coming down, but I'll say it anyway. It was marvelous! An area equivalent to what took me weeks and weeks, over years, to clear was gone in about an hour. If I would have been sure I could have gotten right back up, I would have dropped to my knees, that's how thankful I was. And if I hadn't been so happy, I probably would have cried. The first boxelder (first photo) was fairly straightforward to fell. The second (above) had multiple trunks. They had a winch rope that helped pull the felled trees to the shredder. A lot easier than pulling them yourself, I can assure you. I wish I had a shredder like this. I had to cut up dozens of 15-ft trees to get them to fit into twenties of yard waste bags. 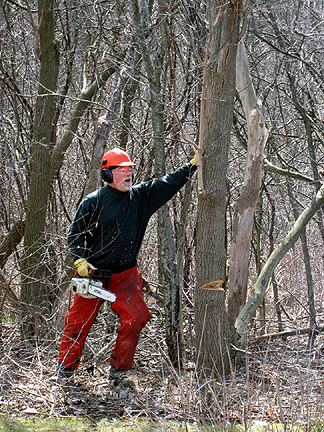 Die buckthorn die! Buhahaha! Here's what the cleared area looks like. I've still got a lot to pull out and clean up, but it's huge progress. 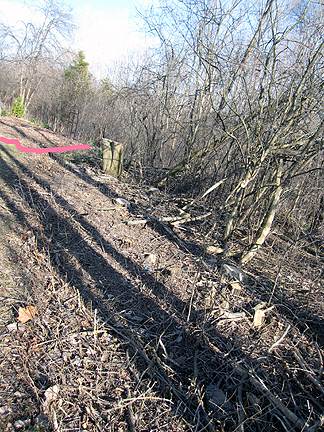 The pink line is where my previously cleared section starts. This was your lucky day, Monica! Isn't it amazing what a crew equipped with power tools can accomplish? 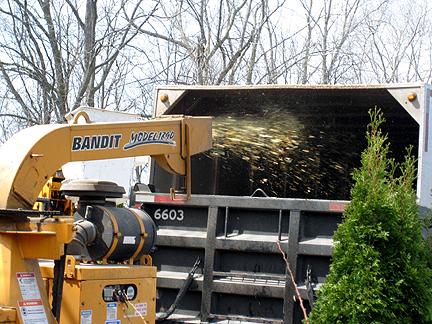 I've been coveting one of those big chippers for awhile, but have no idea how I'd get it home, not to mention I'd probably be too frightened of hurting myself to actually use it:) But it sure would be nice to have something to shred up some old pine limbs for mulch for me. Do I sense a new song coming on?? Isn't it wonderful! Good for you and your garden. Don'tcha wish you could have those guys and that shredder for a whole day. 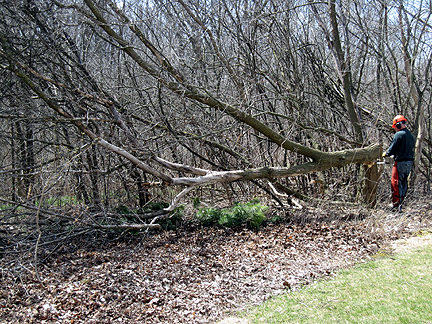 Hope it wasn't an April Fool's joke about the buckthorn, Monica! Happy sun, happy spring, and happy Easter (are you tan yet with all this awesome weather)! Enough though ... 82 tomorrow! Things will be popping too fast to enjoy! That is some good news....I was wondering if you know what these two frogs are that I found today..
Oh, that just sounds great! I'm so happy that worked out for you. Wow, congrats! Let me know if you need any more veggies seeds as I'd be fine with send you some. It is indeed a happy day! Love it when someone else helps you out even if unknowingly. Go veggies! Hi Monica, I hoped you asked them to empty that shredder right there. Probably enough mulch for your garden all year. Poor buckthorn; all it wants to do is be loved! Too bad you didn't have a pile of branches ready to go so you could sweet-talk the guys into shredding them for you. Wie schön liebe Monica. Ich freue mich total mit Dir über diese Aktion. Hooray for you Monica! I can relate to your agony! like my wild raspberry trees that are intertwined in, under, and between my fence!..Arrg!! Yay! now you can grow more of what you love! like that fantastic Hummingbird seed mix! Once again have an wonderful Easter. you gotta love free labor! Keep your saw handy. Those box elders don't give up so easily. New growth will keep sprouting from the stumps almost as fast as you can cut them. I dislike them more than the buckthorns. I had to take out three box elders a couple of houses ago, and even back then about 12 years ago, they cost me over $1,000 to remove. Free is awesome! And buckthorn removed as part of the freebee - even awesomer! Aren't those shredders awesome, Monica? When one of our huge Arizona Ashes croaked we were stunned to see how fast the trunk and branches disappeared. But it did cost a bundle! Getting rid of buckthorn and getting some sun on someone else's tab...priceless. Congratulations! I've coveted a chipper for years, but a crew to go with it would be even better. Hooray for more sunshine!